A wonderful & scarce surviving example of a antique glazed advertising case for Horrockses Miller & Co.
A superb early advertising case containing eleven different samples of the types of cotton & products produced by the company, a lithograph of the cotton plant & original packaging featuring the comany crest. The outer case comes in its original ebonised finish with gilt lettering to the top panel & the neat, symmetrical layout of the interior make it a super decorative piece. Horrockses were established in 1791 by John & Samuel Horrocks & joined forces with Thomas Miller to become Horrockses Miller & Co in 1815. 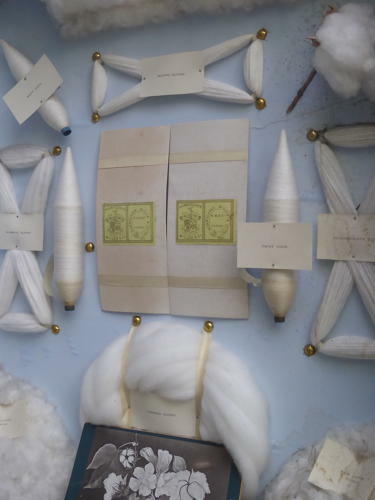 They prospered throughout the 19th century & as the demand for cotton & cloth grew, they employed thousands of people, becoming one of the largest suppliers of cotton & cloth products in Great Britain. A few years after the death of Thomas Miller 1887, the company name changed to Horrockses Crewsdon & Co. Wear commensurate with age, good untouched original condition. Some expected age related marking & signs of age to the areas of the interior of the case, original glass perfect with no damage.